Abondoned, the two-year-old girl Asia is found by Patti, a circus woman living with her husband. Walter in a trailer park in San Basilio on the outskirts of Rome. With the help of Tairo, a 13-year-old boy who lives with his grandma in an adjacent container, Patti starts to search for the girl’s mother. 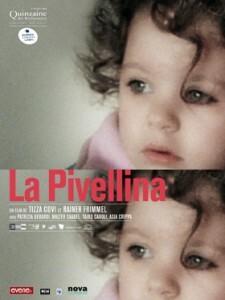 La Pivellina is a film about a cosmos of outcasts in present-day Italy: a tale of courage and discrimination, of loss and togetherness, a look behind the corrugated-iron fence of a gated community.